The year was 1963/4. My old man got so fed up with the noise and complaints he bought me a car !! 1952 Ford Anglia, sit up and beg ,produced in black, black or black. I eventually sold it at a huge loss and bought a 1954 left hand drive VW beetle with a broken crank, rebuilt the engine and never looked back, by then I was a second year apprentice at the main VW agency in West Bridgeford, Nottingham, Beardall motors which was bought out by Bristol Street Motors in 1968 and as far as I know is still going under the same name. When I think of all the old banger's I kept running for mates and people who paid me, cars built between the early 50's and early 70's it makes me wince, people now don't know how lucky they are to have such an amazing choice of motors built with 21 st century technology , ABS brakes,high performance motors that go miles on an egg cup full of fuel, air con, sound systems, fuel injection, plush interior comfort,incredible built in safety, I couldn't and wouldn't go back to those old bone shakers ever, what say you? Not convinced never cars are better , they are safer stronger handle better brake better quiet comfortable warm or cold have traction control electric windows heated seats climate abs good lights yes they have lots going for the newer cars. All this said i think cars now could be so much better and be better by being worse. I personalty do not want electric windows i don’t want super grippy low profile tyres that belong on a race track not a public road, i dont want low profile run flats with all the bad ride and expense. Dont want climate control central locking complicated mobilisers dedicated coded in keys and all the other pointless luxury toys some crave so much. I want the build quality i want the electronics contrling the engine but i want it mega squirt and mega volt style reprogrammable settings relatively cheap generic or ford components in systems. after all cars in days gone by were generic in that the cars had same headlights make model and brand to brand. a transit ml1 sealed beam would fit a mini a triumph spitfire a hillman minx or a jaguar now every car as its own lights. Weight its emissions killer so these modern cars need to loose it, ditch the electric window motors relays wiring all tthe other pointless stuff reduce weight help braking acceleration cornering fuel ecconomy and make cars cheaper too . They have got too powderfull too heavy and complex for their own good, Why do we need a turbo on a road if i could have my volvo with no turbo i would give up the power instantly for the assurity its not going to fail clog its oil ways with shavings wreck its crank oil system when it fails. No massive strip down oil pipe change sump off hassle not counting the expense of buying a turbo after all this. No sorry i am probably on my own here but i am sick and tired of all this modern car merry go round we need simple basic with all the good bits of modern cars in a more accessible format the motor trade as had it too good for too long now cars are rediculous prices now to what they were back then and maybe only i would buy a basic no frills non turbo non electric window car but it would be a step away from the acepteds norm of today i would love to have the option to take. We have a fiat topolino in work and it’s more fuel efficient than a modern car! I agree that modern cars are better, no doubt about it. However there are fewer new cars that excite me much (that I can afford anyway!). One of the things I will miss when I get a newer car will likely be the lack of manual gearbox. They used to be slow, lazy things and always slower than the manual equivalent. I was taking a drive last year with a mate in his golf r (a mk 6 I think) and told him that VW had just announced the type r would only be sold with a DSG going forward. He was so disgusted that he immediately called his dealership and asked them to find him a manual mk7.5 type r which he bought the next week! The DSG is quicker, more efficient and more convenient that the manual, but we can lose something with progress! Some of the best times of my life I had were in the 50s and we had the Ford Pop van version for delivering milk. I passed my test and then had use of the van for evenings but spent most time scrubbing the wooden floor to get rid of the smell of sour spilt milk before going to a Young Farmers dance. As said, the brakes were terrible ...rod operated if I remember. I could just about hit 60 going downhill with a run at it. Then my father purchased the up rated car version and you could choose about three colours then and ours was green. I remember five of us youngsters driving to the Welsh coast for the day( we lived in North Warwickshire) hilarious. Then in 1960 my father bought a Ford Consul Low line, the model with the stainless front window surround AND full width bench seat and things started to get interesting. Got married in 1963 and purchased a Wolsley Hornet brand spanking new. This car got seriously up rated and became my rally car, race engine tune, Minilite wheels, all singing all dancing BUT back then if we had a problem out in the boonies we could mackle the motor and drive it home. These days no chance. Yes, the old days where the good days in my opinion BUT I still wouldn't swop my X type Jag AWD Estate which is a joy to drive and was the only car I saw that Clarkson didn't ridicule. Don't tell my old Landie I said that or it wont start in the morning. Some old cars were shocking one memorable chain of events one night up in the north east surrounded a AUSTIN farina A 40 mk 2 they were the 1098 engine A series like a morris minor engine. Staying with a mates sister who married a farmer up the north east, we were 17 went up on motorbikes i had a trident he had a Honda 400 four we were used to speed and though nothing could scare us . One night we ended up in a pub about 6 miles from the farm with mate brother in law and sister. they got called back to farm and a lift was arranged for us after closing. Chucking out time we are in this old Austin with this very chatty bloke in his late 20s, first five mins he is normal then out of nowhere on a long straight he sets off i knew he had had a few beers but he seemed ok but as speed hit 70 on this wet b road i was getting a bit concerned, rounding this corner he lost it hits the bank at the foot of a dry stone wall swerves to other side of road on the verge and car is sliding down a barbed wire fence line knocked about three posts down before he stopped it. i gets out the car could not believe the state it was in front wing ripped off and drivers door bent in and back about 6 inch passenger door although it opened would no longer shut and the top tailgate was open it did that all by itself . That car was so weak it had no structure about it was just a flimsy old car. I learned two things that night Never get in a car with a drunk and avoid old rot boxes like that A 40 . You could tweek those rod breaks if you bent them a little bit. Modern cars are brilliant. Climate, sound system, satnav etc. etc. but they aren't any fun. Now, that Lotus Cortina that I had from '70 to '76... That was fun and I really, really wish I still had it because it would be worth £100K today. Try a 1931 Austin 7 with cable brakes, the back to front 3 speed gearbox and a clutch action like stamping on a concrete block. Nothing to worry about. I had a Hillman Imp. It was never going long enough to find out if it even had brakes. 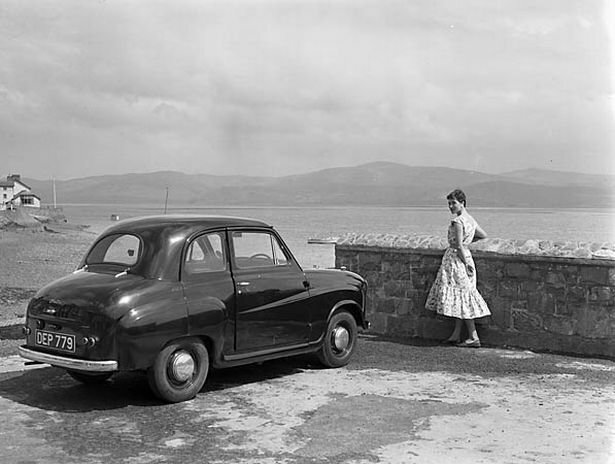 My first car was like yours a sit up and beg Anglia, side valve engine , 3 forward gears but it was freedom to fish and to wildfowl. Mine cost £100 but its slow speed and lack of performance saw me safely through first year of driving in one piece. Imps were a mixture of brilliant and just disgustingly BAD! Engine was in stock form quite good on power but overheating was a constant problem, you just could not rely on them. You might go years not have a problem but straight out the blue Bang its gone and spewing water everywhere. if you hotted them up any they got worse, only way you could get them reliable was Wills Rings. Get this mod done they would stand some abuse , get a head job done R17 camshaft a few other mods along with a capacity increase to 1 litre from the 875 and you had a quick car in your hands for back them. DE camber kit up front and they had traction due to the engine position and grip to spare in the turns. great little cars. I was a student at the time I had my imp and worked at M&S early mornings. The car was so unreliable I bought a motorbike to ride to work when it would not start. ..... sit up and beg Anglia, side valve engine ...... saw me safely through first year of driving in one piece. Good reliable basic transport, those SV Fords, but not much fun driving up long hills in the rain with no wipers. From:Lincoln (ish) well close to it! Just going through this with bikes again. Even my 7 year old Triumph Explorer is seeming long in the tooth compared with some of the ‘19 models.... *** .... Bluetooth, programmable GPS and remote off bike functions..... are they all necessary? Of course not but are they useful and they do enhance the riding experience allowing more of the brain to do important things like bend assessment and anticipation. The bikes we have today were only things of science fiction in my spotty youth days! Oh yes forgot about the vacuum operated wipers and the semaphore indicator. Imps were a mixture of brilliant and just disgustingly BAD! Engine was in stock form quite good on power but overheating was a constant problem, you just could not rely on them. You might go years not have a problem but straight out the blue Bang its gone and spewing water everywhere. I had forgotten about those vacuum driven wipers,you had to keep taking your foot off the gas to build up enough vacuum in the storage tank to get them to run, but when you were running right foot heavy they would just grind to a halt, mine were so bad we kept a ball of string in the car , when it rained I would tie a length of string to the wiper blades and run each end through the side windows, one left and one right, any passenger would have to pull the blades back and forth while I drove, what a laugh !! Had to do that with my MG montego once, had to use my belt and the wife's tights that was a laugh. So true so true, with progress we no longer need to wind down the windows and use hand signals. But you still can if you want to, much the same with a dsg you can still manually change gears just don't have a clutch to press.